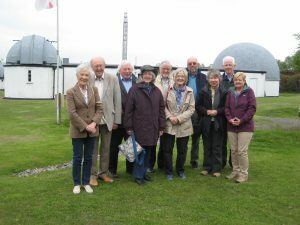 On May 16th 12 EUC members joined an open afternoon at the Norman Lockyer Observatory, outside Sidmouth. The Observatory, owned by East Devon District Council, is operated by volunteers, all members of the Norman Lockyer Astronomical Society. Sir Norman Lockyer was a pioneering late C19 astronomer. In his remarkably long and active life – he lived to 96 – he had many achievements. For instance, he discovered the important element Helium, and he was for 50 years the editor of the journal Nature which he had founded. The visit began with an introductory film about the sun, after which we split into 3 smaller groups to visit in turn the planetarium, two domes each housing an historic telescope, and the radio astronomy room. Our guides were without exception experts in their field, informative and witty speakers, able to explain an esoteric subject to a largely astronomically ignorant audience. In the planetarium we observed the sky as it would appear that night over Sidmouth, the planets and various constellations pointed out to us. The planetarium was then rotated to show us how the heavens would appear to the Australians, and to the people of Central Africa. We were therefore enabled to see the Southern Cross, as well as our own Milky Way. The planetarium equipment had been “inherited” from Greenwich Observatory some years ago. 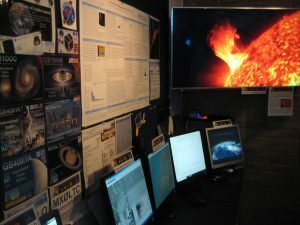 The radio astronomer who operates in a room full of computer screens, showed us how sunspot activity has affected climate over the centuries. We also saw evidence of asteroid showers, an asteroid being the size of a coarse grain of salt. 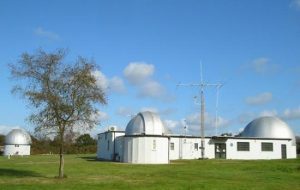 There are links between the radio astronomy at NLO with astrophysicists at Exeter University, so the observatory is more than just an historic monument. The two historic mid and late C19 telescopes we were shown were the Kensington telescope, designed and built by Norman Lockyer on land now occupied by the Science Museum in South Kensington, and the Norman Lockyer telescope which is still used regularly by members of the Society to scan the heavens every Friday evening. I think we all felt it had been a most informative and enjoyable visit.